BEIJING (AP) — They have been praised by the leader of al-Qaida and wooed by the head of the Islamic State group. They have distinguished themselves on battlefields in Syria and are accused of carrying out a devastating bombing in Thailand. In the past two years, militants belonging to the Uighur ethnic group native to the vast Xinjiang region in western China have shown signs of becoming a force in Islamic extremism globally, a development that is reshaping both the ground war in Syria and Chinese foreign policy. The predominantly Muslim, Turkic-speaking people — ethnically distinct from China’s Han majority — have chafed for decades under Beijing’s heavy-handed rule. Uighur separatists belonging to the East Turkestan Islamic Movement (ETIM), a militant group based in the rugged tribal areas of nearby Afghanistan and Pakistan and allied with al-Qaeda, have been blamed for attacks in Chinese cities, often using crude but effective weapons such as knives, Molotov cocktails and speeding vehicles. Their activities have taken on a transnational dimension in recent years as hundreds of Uighur fighters have flowed into Syria to participate in jihad. And instead of targeting China’s cities, militants have struck less guarded overseas targets. The reach of ETIM, which seeks to establish an independent Islamic state called East Turkestan, was highlighted most recently when a man crashed a van packed with 100 kilograms (220 pounds) of TNT into the Chinese diplomatic compound in Bishkek, Kyrgyzstan, killing himself and wounding five people. Kyrgyz officials on Tuesday identified the bomber as Zoir Khalimov, an ethnic Uighur member of ETIM who carried out the attack with support from the Nusra Front, the al-Qaida affiliate in Syria. In Thailand, a trial began last month for two Uighur men charged with an August 2015 bombing that killed 20 people at a busy Bangkok shrine. The attack came weeks after Thailand forcibly repatriated scores of Uighurs to China, where they faced persecution. Chinese officials said the Uighurs were on their way to fight in Syria when they were arrested. Analysts see the broad outlines of metastasizing Uighur militancy that has prompted a response from China, which has traditionally abided by a foreign policy of non-interference. In mid-August, China dispatched a senior People’s Liberation Army admiral, Guan Youfei, to meet with Syrian Defense Minister Fahad Jassim al-Freij and a senior Russian military official in Damascus to discuss expanding Chinese support for their war effort. China has made similar moves closer to home. This year, it pledged equipment and counterterrorism training for Afghan police with the aim of containing ETIM. It has also expanded its role as a mediator, welcoming both President Ashraf Ghani and Taliban representatives to China on visits and brokering low-level talks between the sides. In 2015, Uighur fighters from ETIM, also referred to as the Turkistan Islamic Party (TIP), began flowing from Central Asia into Syria, according to propaganda videos from the group’s Islam Awazi media arm. They have won battles against loyalist forces in Idlib and Aleppo provinces, at times deploying suicide attackers to decisive effect. Although exact numbers are impossible to confirm, analysts believe there are hundreds, possibly more than a thousand, Uighurs fighting alongside the Nusra Front, said Beirut-based analyst Haytham Mouzahem. Separately, the Islamic State group, which competes with the Nusra Front for recruits, has at least a hundred Uighur fighters, most of whom came directly from Xinjiang to escape religious persecution in China, according to leaked IS documents analyzed by the New America Foundation think tank. 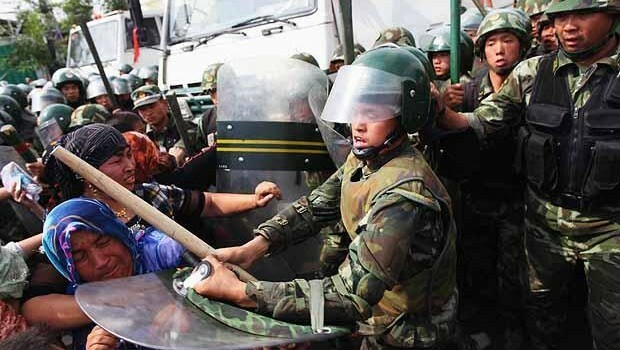 Uighur groups in exile and international human rights monitors say China plays up the threat of Uighur militancy to justify abusive law-enforcement policies and religious restrictions in Xinjiang, which have fueled resentment among ordinary citizens. ETIM’s organization may also be overestimated, experts warn, because it is unclear to what extent they offered training or support to perpetrators of attacks. China has been sensitive to international criticism of its policies in Xinjiang while casting itself as a target of terrorism similar to Western countries. It has successfully lobbied the United States, the European Union, Russia, Britain and other governments to recognize the Turkistan Islamic Party as a terrorist organization. “I would to stress that East Turkestan terrorist forces headed by the ETIM have plotted and undertaken terrorist attacks many times inside and outside China,” Foreign Ministry spokeswoman Hua Chunying said Wednesday, while vowing to “strike back” at the group. Chinese anti-terrorism expert Li Wei said the extremist threats that China faces domestically and from abroad are now “inextricably linked, just like with other countries,” leading China to expand its dealings in Syria and Afghanistan. “I think the international community would agree that Syria is a nexus of global jihad that does threaten the entire world,” said Li, director of the anti-terrorism research center at the China Institute of Contemporary International Relations, a think tank under the Ministry of State Security, China’s main intelligence agency. Despite its shifting posture, Chinese observers say the likelihood of the People’s Liberation Army fighting directly in Syria and Afghanistan remains extremely low. Over the last decade, China has leaned on Pakistan to carry out drone strikes against TIP commanders in tribal Waziristan, pressured Central Asian allies for intelligence-gathering and sought help from Thailand — but never deployed troops. China’s increasing willingness to confront Uighur militants abroad mirrors global jihadi networks’ growing interest in their cause. In the 1990s, the Taliban — no strangers to fighting communists — sheltered Uighur separatists but forbade them from launching attacks on China from Afghanistan and Pakistan, fearing that would anger Beijing, according to writings by the jihadi Abu Musab al-Suri. And in the years before the Sept. 11 attacks, published interview transcripts show Osama bin Laden downplaying the Uighurs’ plight or claiming ignorance of them altogether. Instead, he argued that Chinese leaders and Muslims should unite against what he considered to be common enemies like the United States and Israel. His successor, Ayman al-Zawahiri, takes a starkly different approach, decrying China as an enemy. He opened a recorded message to his followers in July by praising Uighurs’ dedication to global jihad and lambasting “Chinese invaders” as “atheist occupiers” of Xinjiang. Islamic State group leader Abu Bakr al-Baghdadi has also prominently decried Chinese oppression of Muslims while laying out a vision of an Islamic caliphate stretching from Morocco to Xinjiang. Michael Clarke, a researcher at Australian National University, said competition for Uighur recruits between al-Qaida and Islamic State explained the heightened rhetoric, but also underscored the more complicated landscape facing China. Associated Press writers Bassem Mroue in Beirut and Leila Saralayeva in Bishkek, Kyrgyzstan, contributed to this report.